Book a comfortable and affordable people carrier in Edinburgh. At Capital Cars, we offer the best option for moving medium-sized groups of four to eight people for the best value in Edinburgh. Whether you need to go to an event or party, take your family to the airport or go sightseeing in comfort, our people carriers are the perfect solution. 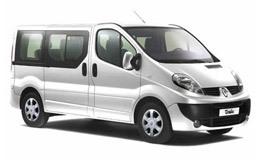 We have a fleet of four to five, six and eight seater people carriers. Our models include Mercedes Vito, Volkswagen Sharan, Volkswagen Touran and Vauxhall Zafira, a range of the best vehicles on the market that will drive you in comfort and class without you having to worry about the final price. Furthermore, if you need an airport transfer or are carrying luggage with you, our eight seater cars can safely carry your bags. So, why not make every journey with your friends and family a memorable occasion from the moment you hop in your taxi? Let your holiday or party start right when our cars pick you up at your door! You can book our people carriers by phone, online or using our iPhone and Android apps. Your car is two clicks away, sit back and enjoy the ride!